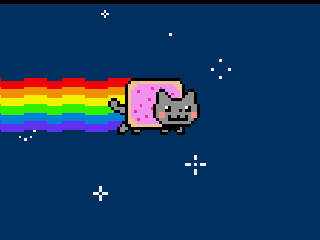 NyanCat for the Atari Jaguar writing just for fun. well, it's not exactly Mad Bodies, but I suppose the music is kind of catchy and the baby jaguar has some interesting chemtrails. Compiled virtualjaguar to try it - it worked. It pegs an entire core on my i5 though, making the thing slightly laggy. I guess the Jag is too rad for my laptop to handle. inb4 BiTL tells you to burn in hell. I still like the Nyan. I also think the Jaguar is cool. So there! It was known since the beginning that Jaguar was made for the great things. The cat is afraid of the jaguar! Allez le fauve.... BOUFFE LE ! Oh I almost forgot ... NYAN! page created in 0.015306 seconds with 15 queries.